Antarctica has lost about 3 trillion metric tons of ice since 1992. Ice loss is accelerating and that’s helped raise the global sea level by about 8 millimeters. Antarctica is losing ice at an increasingly rapid pace. In just the last five years, the frozen continent has shed ice nearly three times faster on average than it did over the previous 20 years. An international team of scientists has combined data from two dozen satellite surveys in the most comprehensive assessment of Antarctica’s ice sheet mass yet. The conclusion: The frozen continent lost an estimated 2,720 billion metric tons of ice from 1992 to 2017, and most of that loss occurred in recent years, particularly in West Antarctica. Before 2012, the continent shed ice at a rate of 76 billion tons each year on average, but from 2012 to 2017, the rate increased to 219 billion tons annually. Combined, all that water raised the global sea level by an average of 7.6 millimeters, the researchers report in the June 14 Nature. About two-fifths of that rise occurred in the last five years, an increase in severity that is helping scientists understand how the ice sheet is responding to climate change. Antarctica currently contains enough frozen water to raise the oceans by 58 meters. Melting ice from the continent is a major driver of the sea level rise that’s threatening coastal communities and ecosystems around the world with flooding as the climate changes (SN: 12/27/14, p. 29). A good estimate of Antarctica’s ice loss will help climate scientists better predict future sea level rise, Shepherd says, as the planet continues to warm. Melting ice in Antarctica has been fueling global sea level rise for a while, but the rate at which it’s occurring has sped up in the last five years. The majority of the ice loss is happening in West Antarctica. But in a place as big as Antarctica, it’s not easy to gauge the amount of ice and how it fluctuates. Satellites can collect different kinds of data to inform estimates, measuring the mass of the ice sheet or the depth of the ice or the speed at which glaciers flow into the ocean. But sorting out seasonal changes (such as the ice added annually from winter snowfall) from more meaningful long-term ones is hard. This group of researchers made their last big estimate of Antarctica’s shrinking ice sheet in 2012 and found that it had lost 1,320 billion tons of ice from 1992 to 2011 (SN: 12/29/12, p. 10). The new analysis paints a more dire picture. “In 2012, we concluded that over the 20-year period before that, Antarctica had been losing ice at a steady state,” Shepherd says. But the new findings indicate that the rate of ice loss has now tripled, compared with the average rate from 1992 to 2011. The new study combines data from three different ways of measuring ice via satellite to pinpoint a composite number. Researchers first computed the average mass change in ice suggested by each technique. Then they integrated those data, accounting for specific kinds of errors introduced by the different measurements. West Antarctica dominates the melting, Shepherd and colleagues found. It was losing about 53 billion tons of ice each year, on average, in 1992. Now the rate has risen to about 159 billion tons per year. That region probably loses ice more than other parts of the continent because the ice in West Antarctic is more sensitive to small temperature fluctuations. It sits on the seabed submerged in water, while other parts of the continent’s ice sheet, such as East Antarctica, sit higher, exposed to air. Even a small increase in ocean temperature (say, 0.5 degrees Celsius) transfers a lot more heat to that ice than a comparable increase in air temperature, Shepherd says. And when warm water starts to eat away at an ice shelf from underneath, it thins the shelf and hastens melting even further. East Antarctica seems to be more stable. It appears to have even slightly gained mass in recent years, but those measurements are more uncertain. “I think it’s fair to say that the more work that gets done, the picture we get of Antarctica is that it’s more dynamic and more capable of rapid change than we used to think,” says Steve Rintoul, an oceanographer at CSIRO based in Hobart, Australia. Scientists had thought that such a large mass of ice was relatively resilient. Now its vulnerabilities are showing. Rintoul was not involved in the new analysis, but coauthored a perspective and a review on the future of Antarctica and the Southern Ocean in the same issue of Nature. 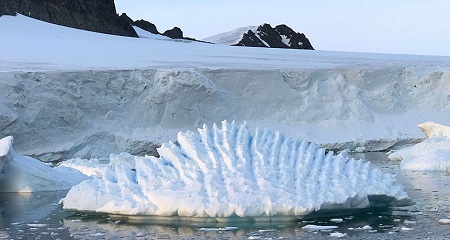 While ice cores can provide clues to Antarctica’s climate going back millennia, researchers have reliable satellite data on Antarctic ice going back only about 25 years. Getting a better handle on long-term trends for Antarctica — and for melting ice in Greenland and in glaciers around the world — requires more data. And that means keeping Earth-observing satellites, funded by governmental agencies such as NASA and the European Space Agency, in the air (SN Online: 2/9/18). A. Shepherd et al. Mass balance of the Antarctic Ice Sheet from 1992 to 2017.Nature. Vol. 558, June 14, 2018, p. 219. doi:10.1038/s41586-018-0179. B. Mole. Year in review: Climate warnings heat up. Science News. Vol. 186, December 27, 2014, p. 29. Photo: MELTDOWN An iceberg floats near the Rothera Research Station on the Antarctic Peninsula. Melting ice from the Antarctic ice sheet, which includes the peninsula, has intensified, new research finds. Source: A. Shepherd/University of Leeds.